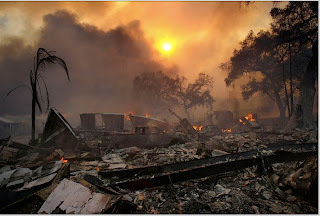 First of all, my condolences go out to everyone suffering thru these devastating fires. I'm not sure how we in the blogosphere can help, but we'll try to relay what information we can get. I think there's a huge difference between a fictional disaster and a real life crisis. Whereas during a fictional account you can sit back and just enjoy the scenario as it plays out, in real life everything becomes chaotic and unpredictable. One of the biggest hurdles they face is idiots who won't evac until the last possible second. I don't think anyone is really prepared for a disaster of any scope. I just read a piece on CNN that said 68K homes are now threatened. I don't think there's that many homes in my entire city. I'll be updating this blog entry as I find more info.